Click HERE to view Mystic Tan FAQ. The ultimate in sunless tanning is the Mystic tan. It is a spray on tan treatment that is done in a Mystic tanning booth. 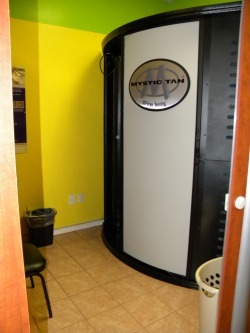 You can find this UV free tanning booth at Tan Avenue in Pinson, AL. Instead of laying under hot lamps, this is a UV free way to get a tan fast. Using an application that produces a airbrush like motion that can make a natural, streak free tan. Mystic tan is available in both ClearMyst for a sun kissed summer tan look, or BronzMyst for the darker bronzed look. What is great about the Mystic tan is that you don't have to prepare weeks in advance when you have an event coming up. Go just twice the week before a wedding, party, or event and you'll be ready with a stellar sun kissed bronzed tan. There is no limit to the amount of times you can use a mystic tanning booth, but for great resulting color, go twice the first week, the second session 4 days after the first. Then maintain by going back every 7 to 10 days. If you prefer to go darker you can book more tanning sessions. No one will be able to tell the difference between a Mystic tan, and a tan achieved with the use of a tanning bed or outside in the sun.